Started as a personal project of interest in the late 1980s the author discovered that several important jazz musicians came from Musko­gee, Oklahoma, the town where he graduated high school, the Oklahoma Music Guide is an attempt at creating a reference source for the primary musicians, musical groups, and musical traditions in what is now known as the state of Oklahoma, but also includes many pre-statehood musical traditions of American Indian, African-American, and Anglo-Amer­ican origins. The first edition of the Oklahoma Music Guide, published in 2003, took a first shot at bringing together two hundred primary entities of interest to the history of music in Oklahoma. 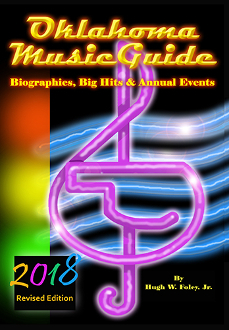 After getting a tumult of positive and constructive feedback, the author realized the Oklahoma Music Guide belongs to the people in it and those Oklahoma music fans that enjoy finding out more about the incredibly rich history of music in the state, as well as the cultural environment that produced important music in multiple genres. A professor of fine arts at Rogers State University in Claremore, where he has taught since 1996, Dr. Hugh W. Foley, Jr. has contributed scholarly articles, book chapters, and encyclopedia entries on American Indian music, rock, jazz, blues, and country music to Oklahoma Humanities (2013), The Encyclopedia of Oklahoma History and Culture (2010), Another Hot Oklahoma Night: A Rock and Roll Story (2009), and The Encyclopedia of New York State (2007), among many others. Also at Rogers State University, he teaches courses in music appreciation, cinema, and Native American Studies on KRSC-TV, the university’s television station, amassing more than 1,000 hours of live television on-air broadcasting since 1998. Dr. Foley is a founding member of the Oklahoma Music Hall of Fame in Muskogee (the beginnings of which were in 1995), was its first vice-president, and has chaired the Oklahoma Music Hall of Fame induction selection committee since 2003. He also serves as a governor’s appointee to the OMHOF board of directors until 2016, and was also president of the Oklahoma Folklife Council from 2005 to 2010.